This month we are taking a field trip to the Cleveland Art Museum and their brand new hi-tech Gallery One. The meeting will start at 10:00am instead of our normal 9:30am. Check below for parking, directions and other information. Bring your entire family, there is something for young and old. Jane Alexander, the museum's Director of Information Management & Technology Services will give us a behind the scenes look at Gallery One and it's technology. There will be plenty of time for you to explore Gallery One, see the new atrium and even have lunch. Make a day of it. Gallery One is a unique, interactive gallery that blends art, technology, and interpretation to inspire visitors to explore the museum’s renowned collections. 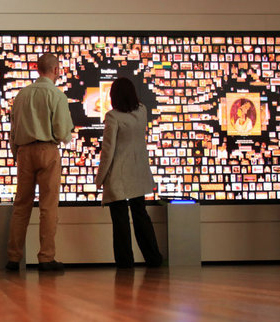 This revolutionary space features the largest multi-touch screen in the United States, which displays images of over 3,500 objects from the museum’s world-renowned permanent collection. This 40-foot Collection Wall allows visitors to shape their own tours of the museum and to discover the full breadth of the collections on view throughout the museum’s galleries. Gallery One offers something for visitors of all ages and levels of comfort with art. Visitors to Gallery One will discover new ways of interpreting the museum’s distinguished collection through a variety of hands-on and technology-based activities. Works of art from the permanent collection on view in the gallery, include masterpieces by Pablo Picasso, Auguste Rodin, Viktor Schreckengost, Giovanni Panini, and Chuck Close. Games encourage visitors to see themselves in the collection, matching their faces to works of art or striking the poses of sculptures. In addition, touchscreen interactives and the museum’s new ArtLens iPad application allow visitors to explore how works of art were made, where they came from and why they were produced. At every turn, technology is used to bring visitors back to works of art and to open multiple perspectives on the collection. Studio Play is a bright and colorful space that offers the museum’s youngest visitors and their families a chance to play and learn about art. Highlights of this portion of Gallery One include: Line and Shape, a multi-touch, microtile wall on which visitors can draw lines that are matched to works of art in the collection; a shadow-puppet theater where silhouettes of objects can be used as “actors” in plays; mobile- and sculpture-building stations where visitors can create their own interpretations of modern sculptures by Calder and Lipchitz; and a sorting and matching game featuring works from the permanent collection. This space is designed to encourage visitors of all ages to become active participants in their museum experience. In concert with the opening of Gallery One, the museum has also created ArtLens, a multi-dimensional app for iPads. Utilizing image recognition software, visitors can scan two-dimensional objects in Gallery One and throughout the museum’s galleries to access up to 9 hours of additional multimedia content, including audio tour segments, videos, and additional contextual information. Indoor triangulation-location technology also allows visitors to orient themselves in the galleries and find works of art with additional interpretive content throughout their visit. If you have an iPad 2 or newer, download and install the ArtLens app. Otherwise, you can rent an iPad at the museum. You can park for free outside on the street or pay to park in the garage behind the museum. From the garage, Gallery One is where you enter the museum.